I have designed and created these pieces featuring the products found on the website, which appear in the product list in bold print. This is a perfect piece for a bride or a special night out. This bracelet gets a lot of attention every time I wear it and I wear it often. 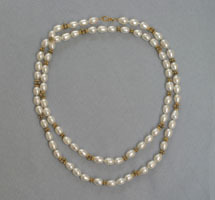 This is a pretty variation on the classic knotted pearl necklace. This pretty necklace compliments multiple colours due to the peacock pearls. The intricate detailing of the handmade sterling silver beads and components add interest. This sweet bracelet is very feminine. 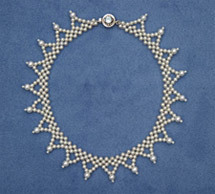 I had a bride in mind when I designed this piece, but I often wear it with jeans. I offer other colours of Swarovski crytals in the kit version as I thought this could be a good bridemaid gift to match to their dress colour. 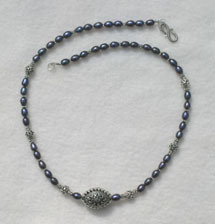 This necklace can be worn doubled, but I prefer to wear it as a single long strand. I love the new highly tarnish resistant silver products that have become available in the last few years, and they open up new possibilities with pearl/silver combinations. 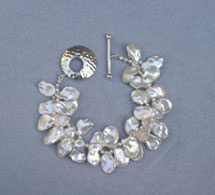 This bracelet is made with Brilliante wire and sheet, argentium wire and pearls. 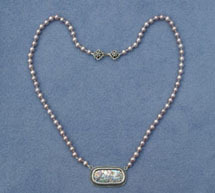 This necklace combines faceted chalcedony briolettes, faceted amethyst rondelles and pearls..